Awesome psychedelic postcard! This is more original artwork from the artist who has sent me much muppet-licious mail in the past. 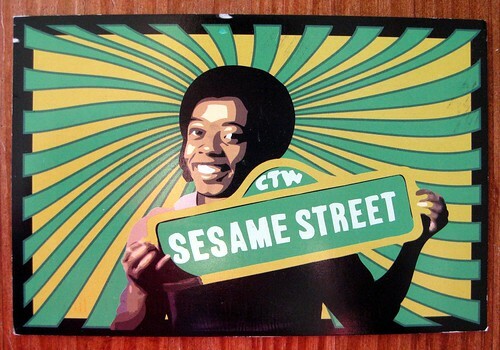 He did the design of this postcard himself, from a Sesame Street image. 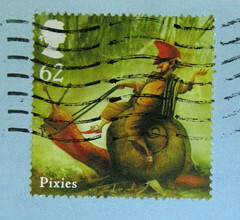 It features a matching stamp! This is Northern J. Calloway, the actor who played David on Sesame Street. The postcard is really nice. I like the pattern behind the actor. I still remember Sesame Street even if I was very little when I watched it. OH MY GOSH I LOVE IT. 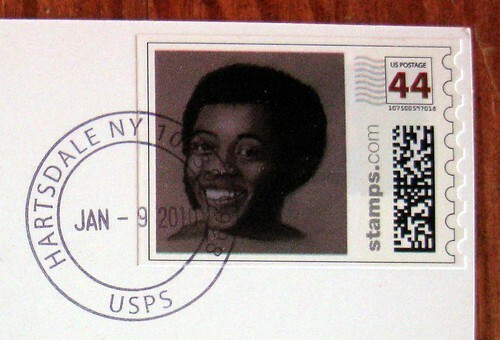 What makes it even better is that stamp! I want Mr. Roger postcards. I bought a sweater in memory of him. I think I'm gonna go out and buy some more today (even if our weather here is getting warmer, lol). I know, doesn't it just take you down old school street? Belen, now I know the perfect postcard to use for you, in response to your AMAZING Bollywood postcard which I adored. Fun card, the matching stamp is cool.